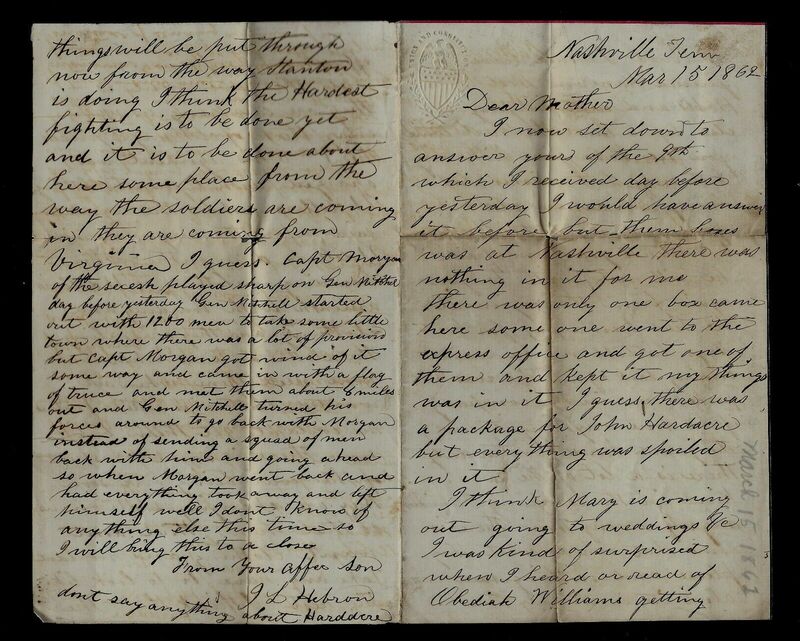 This Civil War letter was written by Jacob D. Row (1835-1910) to his wife Hannah (Knepp) Row (1838-1899) whom he married on 30 June 1861 in Holmes, Ohio. Jacob was the son of David Row (1811-1858) and Sarah Alleshouse (1814-1881) of Crawford, Coshocton county, Ohio. Printed broadside, 18 x 7.75 in., issued August 5, 1864, at Bedford County, TN (about 40 miles south of Nashville), signed in print by two civilians (leading citizens of that county), appealing for assistance from the public. Broadside with 2 in. 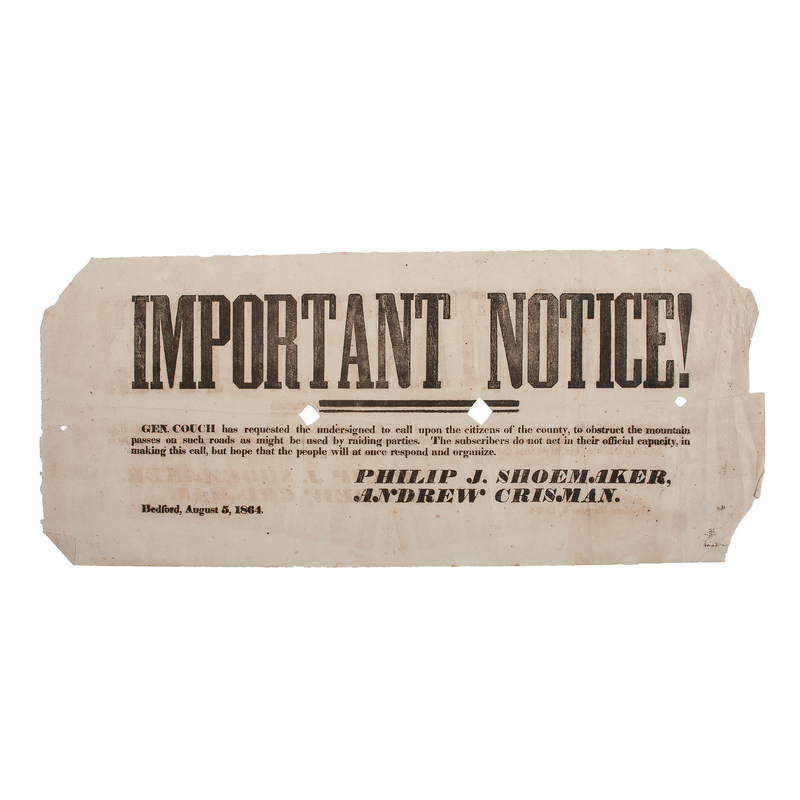 headline, Important Notice!, followed by three bold lines, Gen. Couch has requested the undersigned to call upon the citizens of the county, to obstruct the mountain passes on such roads as might by used by raiding parties. The subscribers do not act in their official capacity, in making this call, but hope that the people will at once respond and organize. A highly significant and rare Civil War broadside produced in the months leading up to the important Nashville Campaign. I now sit down to answer yours of the 9th which I received day before yesterday. I would have answered it before but them boxes was at Nashville. There was nothing in it for me. There was only one box came here. Someone went to the Express Office and got one of them and kept it. My things was in it. I guess there was a package for John Hardacre but everything was spoiled in it. I think Mary is coming out, going to weddings &c. I was kind of surprised when I heard or read of Obediah Williams getting married. I would have guessed Hans and West Hobbs and most everybody else before him. The next time you see Obe, give him my best wishes and Mary Carnahan also. You want me to tell Hardacre to write to you. 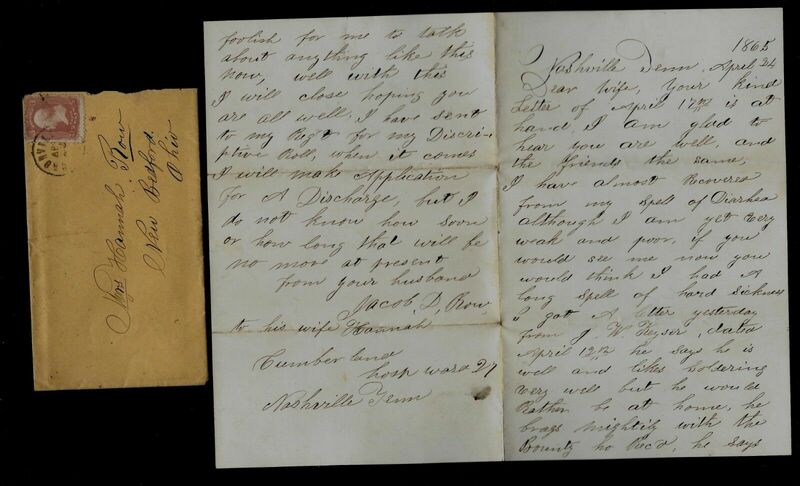 I am afraid he will not write to you again from this regiment. He has been away for 4 or 5 days. He told me he wasn’t coming back again. He [felt he] was a picked one in the company — if he done anything, it was the guard house or extra duty. There is a lot of the same kind in the company. I consider myself among them. There is some that can do what they please and nothing said about it. Not only the officers are imposing on us but the government is. They are charging us with every stitch of clothing 3 prices. The 3rd Ohio Regiment was charged with 6 months clothing 21 dollars when the regulations said before the wages was raised 21 dollars a month without boarding or clothing or 11 dollars a month with boarding and clothing and they are piling the clothes on to us when we don’t need them. When we wanted clothes in Eastern Kentucky, we couldn’t get them but now [when] there is some prospect of the war being over soon, they are changing suits on us so that them that don’t want clothing and wouldn’t take any have to look like the rest. I think that the things will be put through now from the way Stanton is doing. I think the hardest fighting is to be done yet and it is to be done about here some place from the way the soldiers are coming in. They are coming from Virginia, I guess. Capt. [John Hunt] Morgan of the Secesh played sharp on Gen. Mitchel day before yesterday. Gen. Mitchel started out with 1200 men to take some little town where there was a lot of provisions but Capt. Morgan got wind of it some way and came in with a flag of truce and met them about 8 miles out and Gen. Mitchel turned his forces around to go back with Morgan instead of sending a squad of men back with him and going ahead so when Morgan went back and had everything took away and left himself. “John L. Hebron, son of Alexander and Lydia (Giles) Hebron, was born in Steubenville, Ohio, January [or December] 17, 1842, died in the city of his birth, May 25, 1914, and was laid at rest in the family vault in Union Cemetery. He was educated in the public schools of Steubenville, and then became an apprentice to the granite and marble cutting trade. He continued in that line until his enlistment on September 5, 1861, as a bugler in Company G, Second Regiment, Ohio Volunteers. 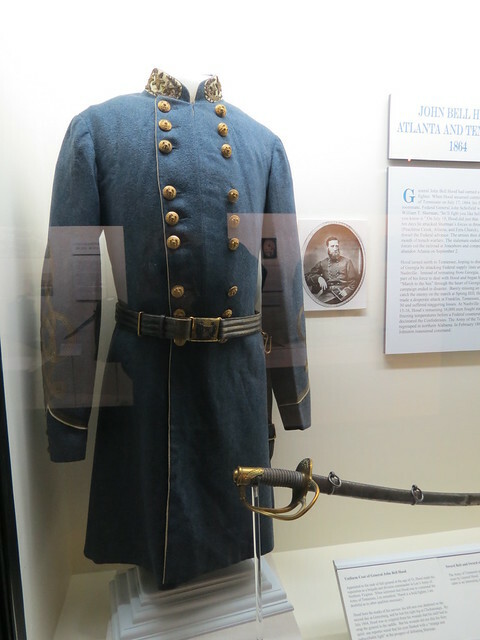 He was engaged with his regiment at the battles of Ivy Mountain, Perryville, Murfreesboro, Stone River, Hoover’s Gap, Chickamauga, Lookout Mountain, Missionary Ridge, and in many engagements and skirmishes. 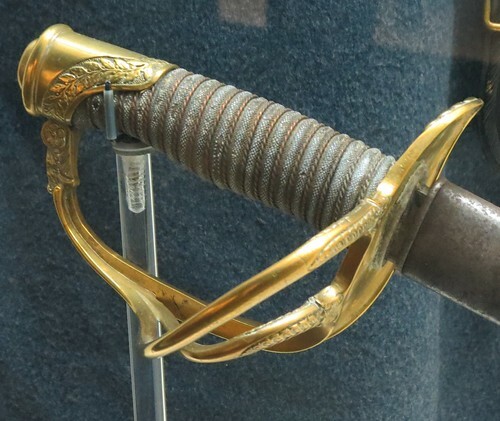 At the battle of Stone River the color bearer of the Thirtieth Regiment, Arkansas Infantry, Confederate, was shot, and the flag of the regiment was captured by Colonel McCook, who gave it to bugler Hebron to take to the rear, which he did in safety. 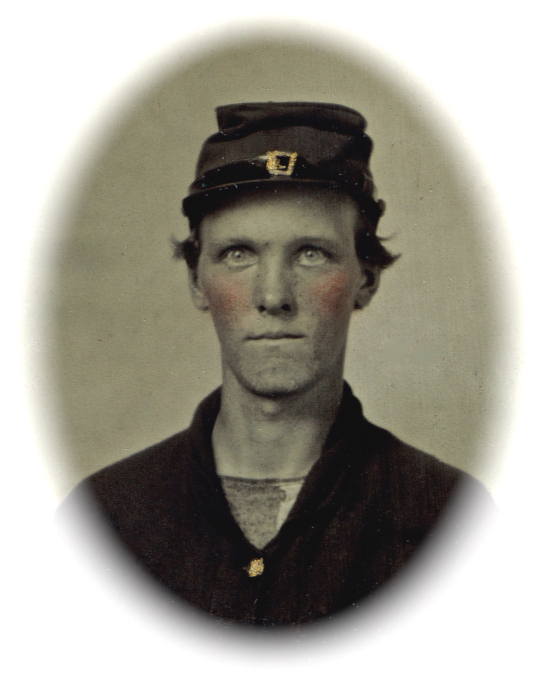 He was honorably discharged from the service in Columbus, Ohio, October 10, 1864, having been in the service something over three years without receiving the slightest visible physical injury. After returning from the war, he resumed work at his trade in Steubenville, and became a skilled marble and granite cutter, specializing in monumental work. 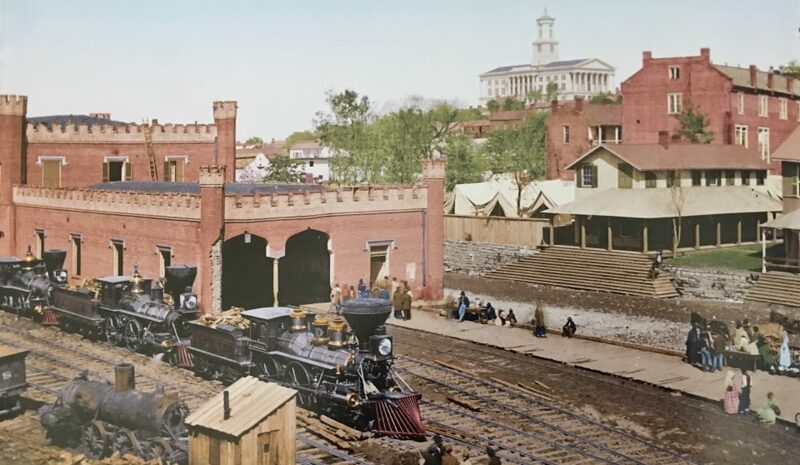 He opened a marble yard in Steubenville, in the McEldowney building on Market Street, and there he continued in the monumental business for many years. He met with a fair degree of success in his business, and many of the monuments and gravestones seen in Union Cemetery were erected by Mr. Hebron. Prior to his passing, he erected a Hebron family monument in Union Cemetery. About the year 1900 he retired from business, being a great sufferer from varicose veins, a trouble induced by exposure and fatigue while in the army. Mr. Hebron was a Republican in politics, and served his city as councilman and member of the Board of Education. He was one of the charter members of Webster Post, Grand Army of the Republic, of Steubenville, was affiliated with the Independent Order of Odd Fellows, and was an attendant of St. Paul Protestant Episcopal Church. He was well known in Steubenville, and was highly esteemed as a man of honor and integrity. The Repository of Canton, Ohio, of 26 May 1914 carried the following cryptic obituary for John under the heading, “He Prepared to Die” — Steubenville, O., May 26. — When John L. Hebron, a prominent Odd Fellow, died here Monday, his grave was dug, his vault built, and the tombstone ready for the date. He had arranged all these in later years. He was 71 years old.